Olympian Cyclist Kelly Catlin Dies At 23 in Apparent Suicide She was found in her dorm at Stanford University last week. Her family says it was suicide. "She saw herself as a warrior, and it was do or die," her sister, Christine Catlin, tells NPR. 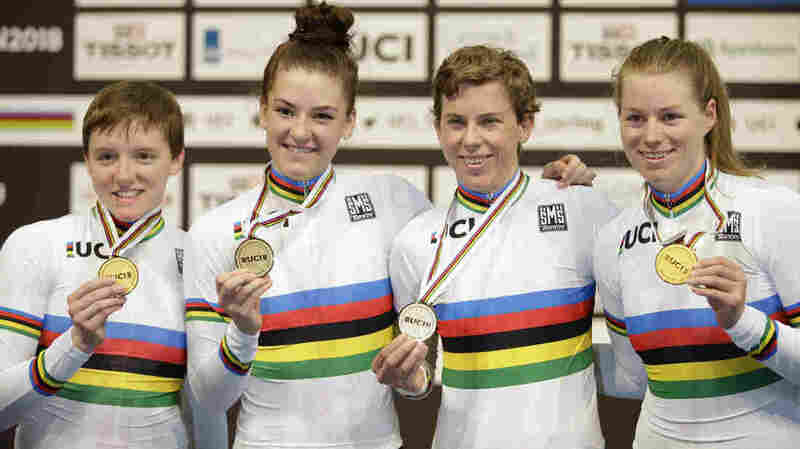 Cyclist Kelly Catlin (left) with her U.S. teammates after they won team pursuit gold medals at the world championships in the Netherlands last year. Kelly Catlin was most known as being a member of the U.S. women's pursuit team that earned a silver medal during the 2016 Olympic Games in Rio de Janeiro. She and the team earned three consecutive world championship titles between 2016 and 2018. She was also pursuing a graduate degree in computational and mathematical engineering. In February, Catlin described the struggle to balance school and cycling. "It's most difficult when you have to retake a three-hour final exam the moment you step out of the final round of a team pursuit. ... And things still slip through the cracks," she wrote in an article for VeloNews, a cycling magazine. Kelly Catlin was born in Minnesota, a triplet from "the bottom of the stack," her dad says. Doctors were worried about her lung development. But Catlin was a natural athlete, her brother, Colin, tells NPR. He got her into cycling "kicking and screaming," until she realized she could win races. "She loved the speed of it. She liked the scientific nature of it — cycling has all these metrics, all these marginal gains." She also enjoyed the independent side of cycling, "going out and trying to ride as hard as she could," Colin says. As a child, Catlin loved horses and tried to petition her parents and the city council for permission to keep a miniature horse in the garage, says her sister, Christine. "We had this secret club called the Federation to Buy Horses," she adds. 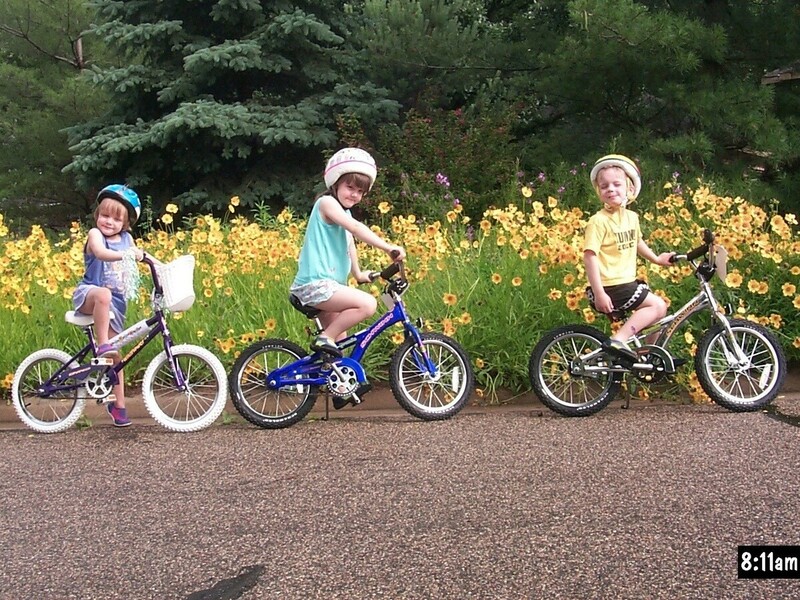 The Catlin triplets on bikes. That love of horses apparently made Catlin a better athlete. "She watched a lot of horse races and would reserve something 'til she came down the end stretch," her mother, Carolyn Emory, says. "This wisp of a girl would pour on the power and outstrip everyone." But Catlin suffered some crashes later in her career. She broke her arm in October and sustained a concussion on a slick road in December. Initially, Catlin didn't remember that she had hit her head and mainly noticed her road rash abrasions. But the concussion changed her, her family members say. "We didn't know about the racing thoughts and the obsessing over different things and the nightmares," Christine says. "We only knew about the headaches." At the end of January, the family says, Catlin attempted suicide. "She had carefully planned it out and had an email she wrote before that she had scheduled for hours after she was already dead," Christine says. "We got it and thought it was a joke for a minute, then called the police." 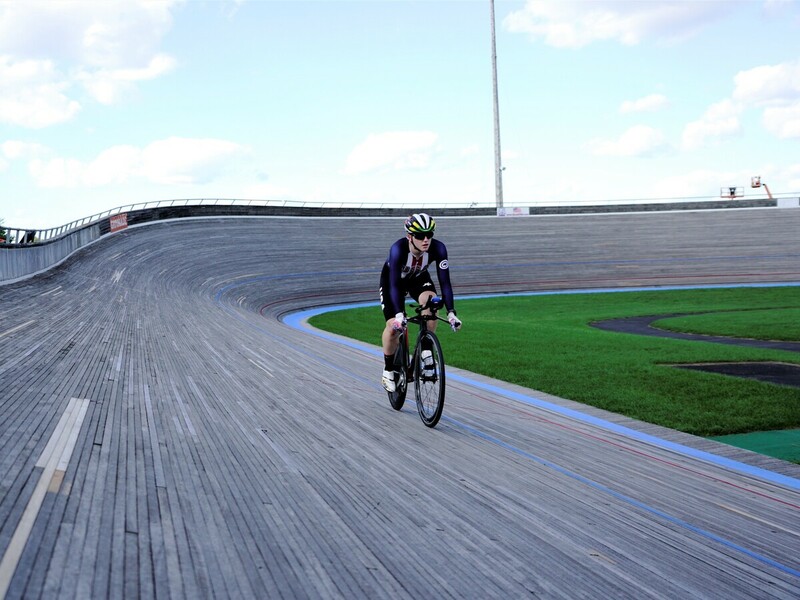 Catlin cycling on a track. The suicide attempt left Catlin with lung and heart issues, Colin says. Her family and her coaches persuaded her to rest, and she withdrew from the 2019 Track Cycling World Championships. But the incident was far from behind them, and she appeared frustrated. "She told me she hated failing the suicide attempt," Colin says. USA Cycling President and CEO Rob DeMartini described her death as a devastating loss. "The entire cycling community is mourning this immense loss," he said in a statement. "We are offering continuous support to Kelly's teammates, coaches and staff." Catlin's personal coach of four years, Stephan McGregor, tells NPR that she was not just a top athlete. "People don't necessarily realize that she spoke Chinese fluently, was a mathematician, was a musician. She was exceptional in every aspect of her life." "The greatest strength you will ever develop is the ability to recognize your own weaknesses," Kelly Catlin wrote in February, "and to learn to ask for help when you need it."